This week’s edition of #SundaySupper is all about “Squashing Winter” and is hosted by Heather, of Girlichef. Thank you, Heather!! 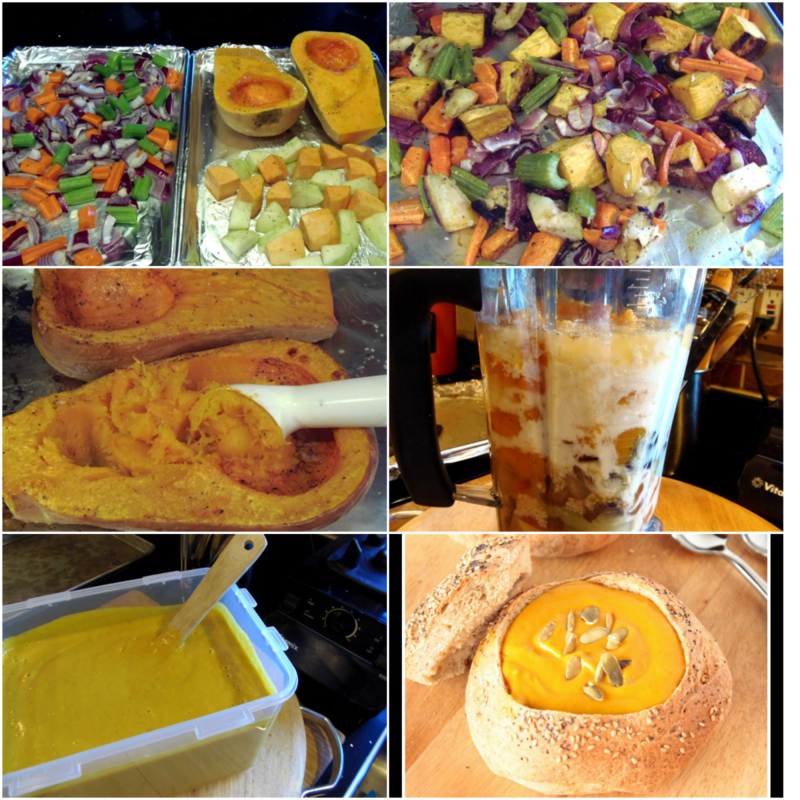 I’m participating this week with my Roasted Butternut Squash and Veggie Soup. This deliciously “squashed” soup can go from fancy (see above) to casual (see below), and anywhere in between (use your imagination, LOL). It’s super fast and easy to whip up and can be a lovely starter soup to compliment any dinner entree (think Thanksgiving), or it can totally stand on its own as the main course (think Saturday night sitting beside a roaring fire)…Talk about versatile! Find out how to make the bread bowls here. -Prepare 2 baking sheets by lining them with aluminum foil (optional but makes for quick clean up). -Place the butternut squash, sweet potato and apple on one of the sheets and drizzle with olive oil. Season with salt and pepper. -Place the onion, carrots, celery and garlic on the second prepared baking sheet. Drizzle the veggies with olive oil and season with salt and pepper. -Place the the baking sheets in the oven for 20-25 minutes. -Remove the baking sheets from the oven and transfer the sweet potato and apple to the baking sheet with the carrots and celery. Allow to cool. -Place the butternut squash back into the oven and continue to roast for an addition 20 minutes. -Remove the squash from the oven and allow to cool completely. -Once cooled, use a spoon to scoop out 1 half of the cooked butternut squash and place in a high speed blender (*see below for instruction on using an immersion stick blender). -To the blender add in 1 cup of the chicken broth, 1/2 cup of the white wine, 1/4 cup of half and half, half of the roasted veggies, 1 teaspoon salt, 1/2 teaspoon black pepper and a nice sprinkling of the nutmeg. -Cover and blend on high until smooth and creamy. -Pour the blended soup into a container and continue the process with the additional squash, liquids and veggies. *If using an immersion blender, add all the ingredients into a large stock pot and carefully blend all the ingredients until smooth and creamy. -Heat through right before you’re ready to serve. -To serve, ladle the soup into bowls and garnish with Pepita seeds. 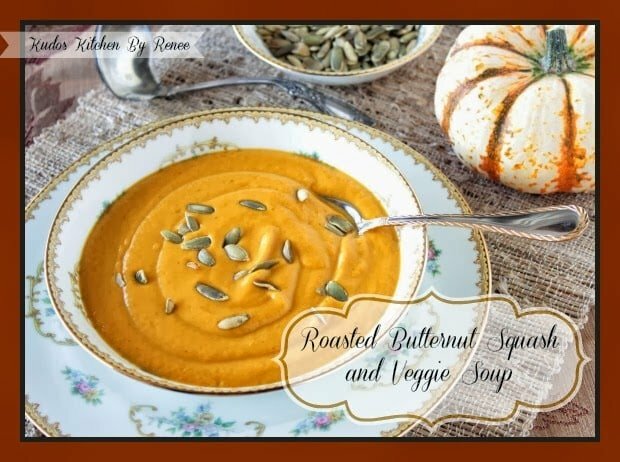 This soup can be made a few days in advance of when you’re planning on serving it which makes it a hostess’ (or busy mom’s) dream! Oh, before I forget… it freezes beautifully too. I have to try this because you have combined butternut squash and sweet potatoes which are my favorites! The apple in it sounds wonderful too. Your soup looks so thick and delish! I love that you served it in a bread bowl! Love the bread bowl and your thick and creamy soup! Thanks for including 30A EATS in your post, live 7am CST by my clock! Guess I need to check them all in the house! OMG, a sip of this smoothie and I'll feel I'm beyond healthy! You certainly packed some nutrition into that blender Renee! I love all of the "hidden" veggies (and fruit) in here – look brilliant Renee. And it fits perfectly in to your Cuban Bread bowls, too ;). Yum. Wow, this looks so velvety! The bread bowls look to die for, thanks for the recipe! I love this soup and have made many variations over the years but my fav is with carrots and apples. Your soup looks gorgeous!! This soup looks like it has so much flavor depth to it! And I love the presentation and photos! 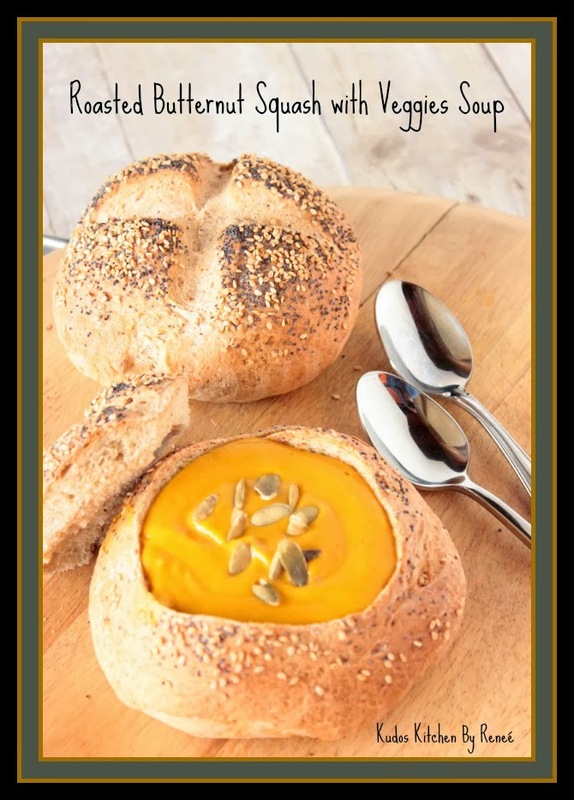 Your soup looks like the perfect meal and I love the bread bowls too! !Lovely flavors and presentation! This soup is so chocked full of veggies! I love to make bread bowls too! I make butternut squash all the time but I love yours with the addition of sweet potato and apples. Wow – what a beautiful, creamy soup! I love the bread bowl too…what a good touch! Butternut squash is one of my favourite soups. Making it with veggies and serving in a bread bowl takes it to delicious new heights. We love butternut squash, but now I am thinking I need to add more veggies to pack in even more nutrition and other flavors!